You need to sign in with your Twitter user name and password. Here you can also check a box to stay signed in, and let the Twitter application run in the background. That's useful if you want it to update automatically even if it is not in the front. The main window displays the most recent messages of your Twitter stream. You can click on any item here to reply to it, retweet it or star it. The client displays the responses a message has received as well. The left sidebar links to the home screen of the application, the connect screen which displays new followers and tweets your account has been mentioned in, the discover screen which displays popular and trending hash tags, and the me screen which displays information about the Twitter user and recent tweets. The two icons on the top right let you compose a new message on Twitter and use the search to find contents on the social messaging site. The official Twitter client for Windows 8 is rather bare bones right now even though it includes all the features that you would expect from a Twitter client. It would obviously be great if you could follow different hash tags easily using the client. Snap view to pin the app to the left or right sidebar. Photos that are displayed and support touch-based viewing. Share charm to tweet from any app you run on the system. Search charm to search Twitter's database. 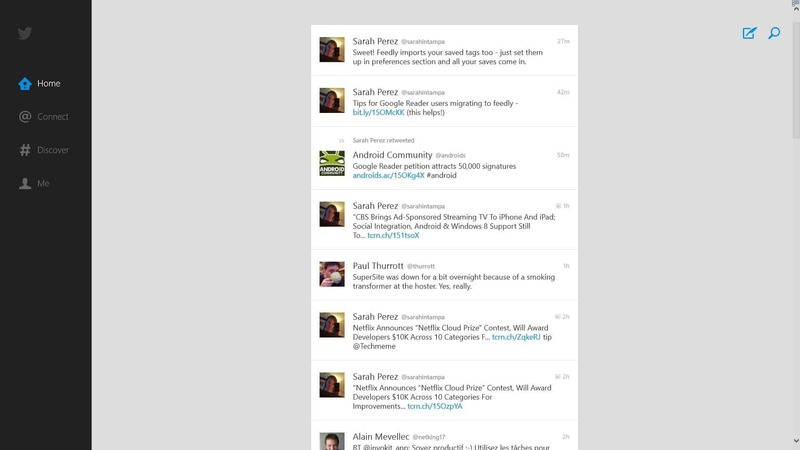 If you are using Windows 8, especially on a touch-based device, this is without doubt the Twitter client to evaluate first. The post The official Twitter app for Windows 8 is now available appeared first on gHacks Technology News | Latest Tech News, Software And Tutorials. Do you feedly? iOS, Android, Chrome and Firefox.